In none of the other Martha’s Vineyard towns does one get as strong a sense of the Vineyard’s maritime history as in Edgartown. Elegant 19th century homes comprise downtown; in summer, their long-established gardens add color and fragrance. Stop in at the Martha’s Vineyard Museumand browse the artifacts, art and other reminders of days past. The town cemetery on the town’s western perimeter includes memorial stones dedicated to Island-born whalers lost at sea. 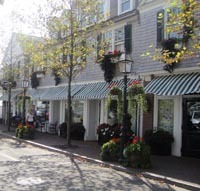 Back in the present, Edgartown draws shoppers, strollers, sailors and seekers of fine food to its boutiques, jewelers and world class restaurants, wine bars and sidewalk cafes. Don’t Miss: A ride on the Chappaquiddick ferry. On the other side you’ll find beaches, quiet country roads, and Mytoi Japanese Garden. 34 South Summer St. on Thursday afternoons. Schedule permitting, visitors are welcome.